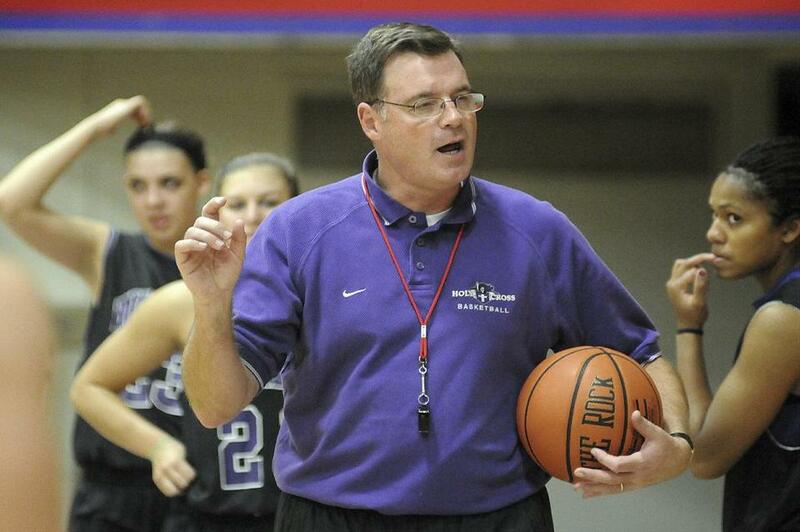 Holy Cross women&apos;s basketball coach Bill Gibbons was suspended Thursday for the remainder of the season after an internal investigation in a personnel matter. Bill Gibbons, the Holy Cross women’s basketball head coach for 33 years, was suspended on Thursday by the school for the remainder of the season as a result of an internal investigation in a personnel matter, according to interim athletic director Brendan Sullivan. The winningest coach in program history, Gibbons has compiled a 613-410 record and led the Crusaders to 11 Patriot League Championships. Gibbons voluntarily took a three-month leave of absence from coaching duties in October 2013 when he was accused in a lawsuit of verbally and physically abusing his players at games and practices. He was reinstated in January 2014 after the college reviewed the findings of an independent investigation. Associate coach Ann McInerney, an Assumption graduate who led the team during Gibbons’s 2013-14 absence, was appointed interim head coach for the rest of the season. Director of basketball operations Sarah Hope was elevated to assistant coach. Holy Cross (11-9) will host Lafayette Saturday afternoon at 1:05 p.m. at the Hart Center. The NCAA sanctioned Missouri’s football, baseball and softball programs after an investigation revealed academic misconduct involving a tutor. Among the penalties were three years of probation and one year of postseason bans for all three programs. The penalties mean the Tigers’ highly-regarded football team won’t be eligible for the Southeastern Conference title game or a bowl game this fall. Their baseball and softball programs will not be allowed to participate in the SEC Tournament or the NCAA Tournament. Missouri Chancellor Alexander N. Cartwright said the school would appeal ‘‘this harsh and inconsistent decision.’’ The Division 1 Committee on Infractions said the former tutor, Yolanda Kumar, admitted in late 2016 she had ‘‘violated NCAA ethical conduct, academic misconduct and academic extra benefits rules when she completed academic work for 12 student-athletes.’’ . . . Asia Durr scored a team-high 24 points to help N0. 3 Louisville (20-1) snap a 17-game losing streak against the UConn women’s basketball team in a 78-69 home victory over the Huskies (18-2). Napheesa Collier led UConn with 20 points and 8 rebounds. Women’s hockey star Kendall Coyne Schofield, who replaced Colorado’s Nathan MacKinnon in the fastest skater competition at NHL All-Star Weekend, said she didn’t believe NBC Sports analyst Pierre McGuire questioned her knowledge of the sport during an awkward pre-game interaction. During Wednesday night’s game in Pittsburgh between the Penguins and the Tampa Bay Lightning, the two were near the ice when McGuire told Coyne Schofield which benches the teams were on and noted the network was paying her to be an analyst, not a fan. McGuire issued a statement saying, “At times my excitement got the better of me and I should have chosen my words better.’’ Coyne Schofield said on Twitter she has known McGuire for years and she knows he respects her ‘‘as a hockey player, a woman and a friend’’ and that’s why she didn’t think twice about the situation when it happened . . . The St. Louis Blues placed winger David Perron, 30, on injured reserve with an upper-body injury. Perron, who had six goals and 10 assists during a career-best 13-game point streak, had missed the past three games . . . Antoine Vermette, 36, a Stanley Cup-winning center who was regarded as one of the best faceoff specialists of his generation, winning 56.6 percent of his 8,948 career faceoffs, announced his retirement after after 14 NHL seasons with the Ottawa Senators, Columbus Blue Jackets, Arizona Coyotes, Chicago Blackhawks and Anaheim Ducks. Nolan Arenado and the Colorado Rockies agreed to a $26 million deal to avoid arbitration, the largest one-year salary for an arbitration-eligible player. Josh Donaldson set the previous mark at $23 million with Toronto last season. The 27-year-old Arenado was set to pass that record even if he went to arbitration. Arenado, a Gold Glove third baseman in each of his six major league seasons and a career .291 hitter with 186 home runs, 616 RBIs and an .886 OPS, asked for $30 million earlier this month, while the Rockies offered $24 million . . . The Houston Astros filled an opening in their rotation, agreeing to a $4.5 million, one-year contract with 32-year-old lefthander Wade Miley. . . AL Rookie of the Year Shohei Ohtani has been medically cleared to resume full strength training on his right arm following Tommy John surgery, but is not likely to be ready to hit for the Los Angeles Angels by opening day. The Angels expect Ohtani, a two-way player, to be their designated hitter at some point in 2019, but he will not be active when the Angels open the regular season in late March. Ohtani is not expected to pitch again until 2020. Red Sox lefthander David Price will wear No. 10 this season, switching from No. 24. The change was made at his request. Bench coach Ron Roenicke, who wore No. 10 last season, will switch to No. 30. Infielder Tzu-Wei Lin returned to No. 5, which he gave up to Ian Kinsler last season. In case you are wondering, Craig Kimbrel’s No. 46 remains available. The righthander is still a free agent with pitchers and catchers scheduled to report to camp in Fort Myers, Fla., on Feb. 12. Scotland’s Celtic signed American defender Andrew Gutman, a 22-year-old Indiana senior who had been loaned to Nashville of the second-tier United Soccer League Championship for the 2019 season, and Manny Perez, a 19-year-old North Carolina State sophomore, to a 3-½ year contracts . . . Bayern Munich of the German Bundesliga signed another American talent from the MLS in 17-year-old Taylor Booth to a 3 1/2-year deal after moving from Real Salt Lake. Booth is expected to play for Bayern’s Under-19 team for the second half of the season, but will first join the Under-23s at their winter training camp in Dallas. . . . The Spanish soccer league says it will sponsor the new Davis Cup Finals organized by a group founded by Barcelona defender Gerard Pique. La Liga says it will promote the tennis competition through its international broadcasts in Europe, Asia, Africa, the United States and Latin America . . . Kiki Bertens and Anastasia Pavlyuchenkova are set for a rematch of their Australian Open encounter after both reached the St. Petersburg Ladies Trophy quarterfinals. Bertens dispatched Belgian qualifier Ysaline Bonaventure 6-4, 6-2 while Pavlyuchenkova saved five of six break points in 6-4, 6-4 upset of former French Open champion Jelena Ostapenko. The eighth-ranked Bertens lost to Pavlyuchenkova two weeks ago in the second round of the Australian Open 3-6, 6-3, 6-3 . . . The Indianapolis 500 will have a new presenting sponsor, Gainbridge, an online annuity and life insurance company, for the next four years . . . Julius Campbell Jr., a former Virginia high school football star depicted in the movie “Remember the Titans,” died Jan. 25 of organ failure. He was 65.